PBJ Quilt Sandwiches: Let It Snow? Ok - seriously, we might get some snow tonight! That is just crazy!!!! I can't believe the weather this past few weeks. It's great - not bad - sorta yucky - gorgeous - rainy - SNOW?!?! What the heck midwest, you need to get on the Spring-train and start warming up! Last night we went to a fundraiser for the SIUE chapter of NSSLHA. The NSSLHA Loves dinner fundraiser is something I was a part of when I went to school and it's really nice to come back each year and see how the event grows. There is a trivia night portion which last year our table was 2nd place and the SIUE faculty was 1st. This year, we were short a player at the table, and got 3rd while yet again the SIUE faculty got 1st. I'm starting to think the faculty have an upper hand, since their students are writing the questions!!! As many of you know, I had to put Scout to sleep due to continued behavior issues about 3 weeks ago. This is the worst decision for any animal lover and ranks up there with loosing a loved one. As my physical wounds heal, my heart will never forget the good times I had with him! A few weeks ago, my trainer suggested I adopt another dog that she knew needed a home. 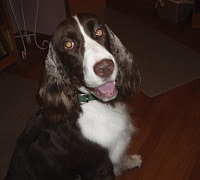 I didn't think I was ready for another dog, but it has turned out that Gabby, who is an 3 year old champion English Springer Spaniel, is wonderful new companion for me and Roxie. I will be showing her in agility and maybe obedience (if my trainer has her way). Here's a pic of Gabby! This afternoon was my friend Kara's bridal shower. I've known Kara since high school and we played in the jazz band together. I think it's really neat how many of us from high school still stay in touch! It was a lovely event and in a really neat local place that I had never been, Bellecourt Place, which my mom has informed me used to be a Baptist Church. I actually got a prize when the timer went off and they were opening my gift! Actually, everyone at our table, except 2 people recieved a "timer" prize! It was too funny - Kara's oldest sister had to keep walking back to the furthest table 6 times to give away prizes. We told her we all should get another prize for having the most prize winners at one table! Kara's wedding is in May and I hope it a much prettier day out than today. Showers for a shower huh?